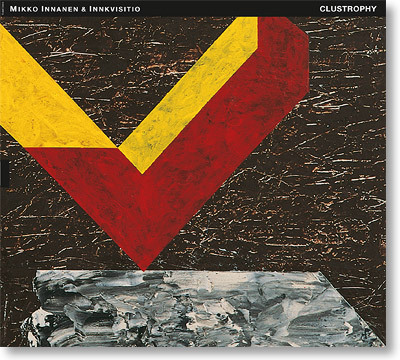 Clustrophy introduces us to a new incarnation of Mikko Innanen & Innkvisitio, a group led by the highly talented and increasingly well-known Finnish saxophonist Mikko Innanen. Whereas the group´s first recording, Paa-da-pap (TUM CD 019) in 2007, featured a quartet of Finns, Clustrophy show-cases a five-piece band with a truly pan-European three-some of saxophonists: Mikko Innanen from Finland, Fredrik Ljungkvist from Sweden and Daniel Erdmann from Germany. After their debut, Innkvisitio has toured extensively in Europe and in North America meeting both with enthusiastic audiences and critical acclaim. Clustrophy brings a new, somewhat darker and more sophisticated, soundscape to the music, in part because of the evolution of the group´s personnel and the music it plays and perhaps also in part because Clustrophy was recorded in a studio rather than being recorded live as its predecessor. Innanen, Seppo Kantonen on synthesizers and Joonas Riippa on drums continue to form the nucleus of Innkvisitio that prepares new material together. Although it is Innanen who suggests new compositions or improvisational vehicles, after that, it becomes a collective effort. With Ljungkvist and Erdmann added to the group, it has continued to develop its unique sound with the third saxophonist permitting an increasingly orchestral approach to the music. At times, the group sounds like a much larger ensemble than it actually is.